It is widely believed that introducing a badger hair shaving brush to your shaving routine results in the most comfortable and best possible wet shave. This is achieved by allowing the badger hair bristles to work the shaving cream lather thoroughly into the beard growth. This softens the beard before blade contact and yields a closer, smoother shave. With this in mind, it’s useful to understand which type of badger hair fibres and weight of shaving brush offer this superior wet shave experience. Wilde & Harte badger shaving brushes use badger hair fibres which are extremely soft. These are taken from the belly of the badger and not trimmed at the ends or coloured, retaining as much natural consistency as possible. The softer the hair, the more it offers moisture retention - vital for creating up a creamy, rich lather to apply to the face. Furthermore, high quality best badger hair fibres will last many years if treated correctly, with minimal amount of fibres becoming damaged and falling out. The shaving brush handle should be tactile and of an aesthetically pleasing design. It needs to be weighty, too, allowing you to feel exactly where you are applying pressure to the fibres against the face. 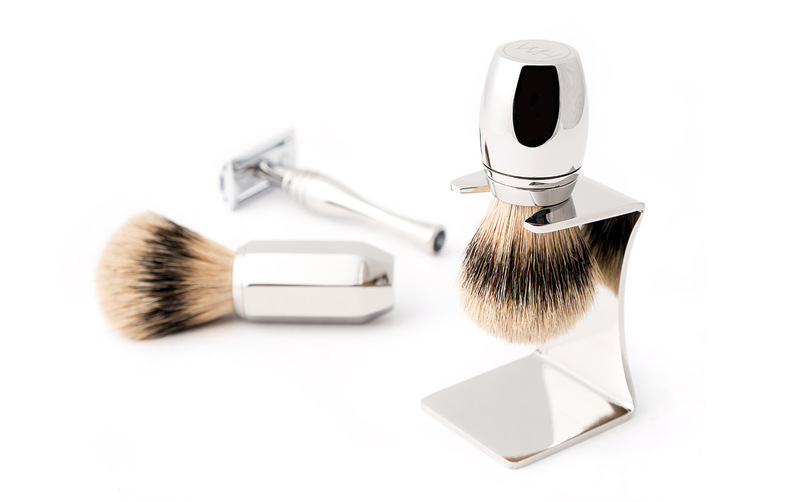 Wilde & Harte shaving brush handles are machined from stainless steel, hand polished to a mirror finish and presented in two distinct designs: a traditional Art Deco design, and an elegant contemporary design. Both of which, feel natural in the palm of hand and assist with working up the necessary creamy lather prior to a luxury wet shave. The handles are designed and manufactured in the UK. They are engineered in such a unique way, that the badger hair fibres unscrew from the handle and may be replaced at a later date. Meanwhile, the stainless steel handle itself will last a lifetime. Engraved detailing add a touch of luxury to each Wilde & Harte shaving brush. Our shaving brushes are purchased in equal measures by both shaving enthusiasts the world over and those looking for a luxury men's grooming gift for the gentleman in their life. To realise the full potential from your shaving brush, after each use, the fibres need to be rinsed in warm water until no visible cream or soap remains, then the shaving brush be hung upside down to allow all moisture to work downwards to the fibre ends then evaporate over night or during the day. A Wilde & Harte shaving brush drip stand is the ideal way to store your shaving brush between wet shaves. It is manufactured from stainless steel, engraved and also and made in the UK. A perfect combination for the perfect shave! Note: Luxury shaving creams and shaving soaps are available from a handful of leading UK grooming brands. They are available in many traditional fragrances such as sandalwood. Typically, a 150ml tub of shaving cream (£15.00 approx.) would last six months, shaving three times a week. 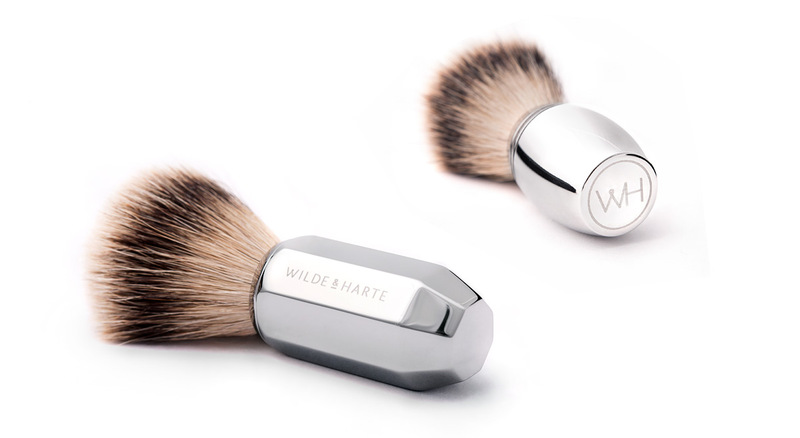 Why purchase your shaving brush from Wilde & Harte? 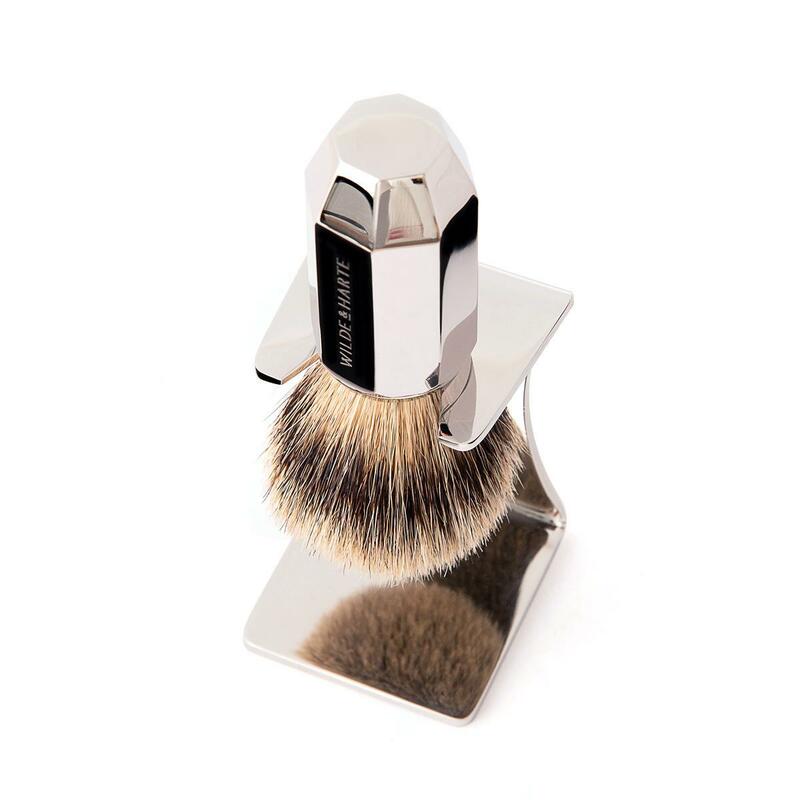 Each shaving brush handle is polished to an impeccable mirror finish by skilled stainless steel finishers, before being laser engraved with Wilde & Harte branding.